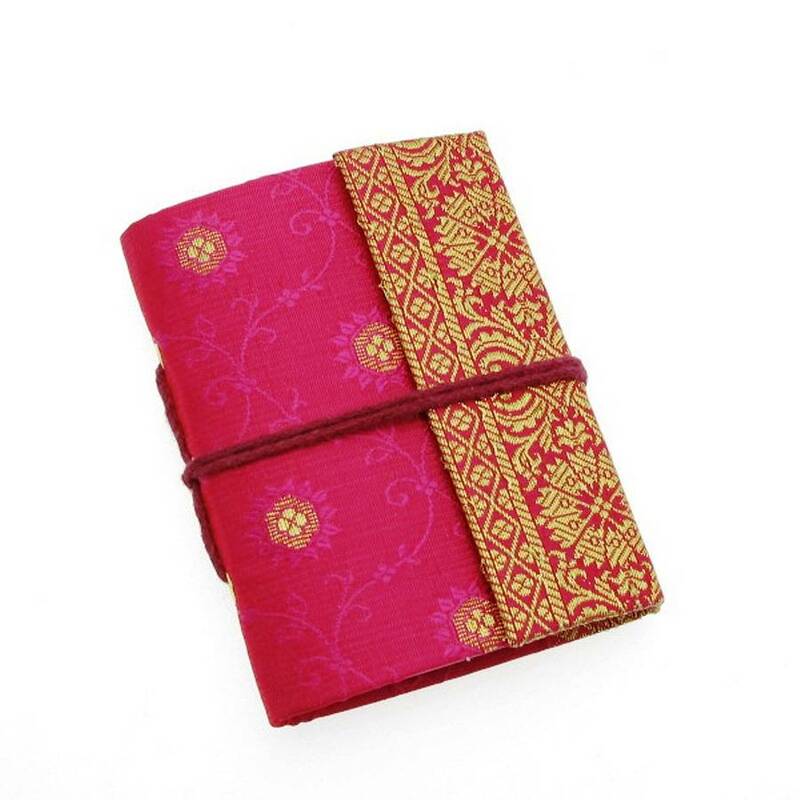 Our fair trade, beautifully crafted notebooks are bound in a vibrant sari and filled with handmade paper, ideal for any stylish writers in your life. 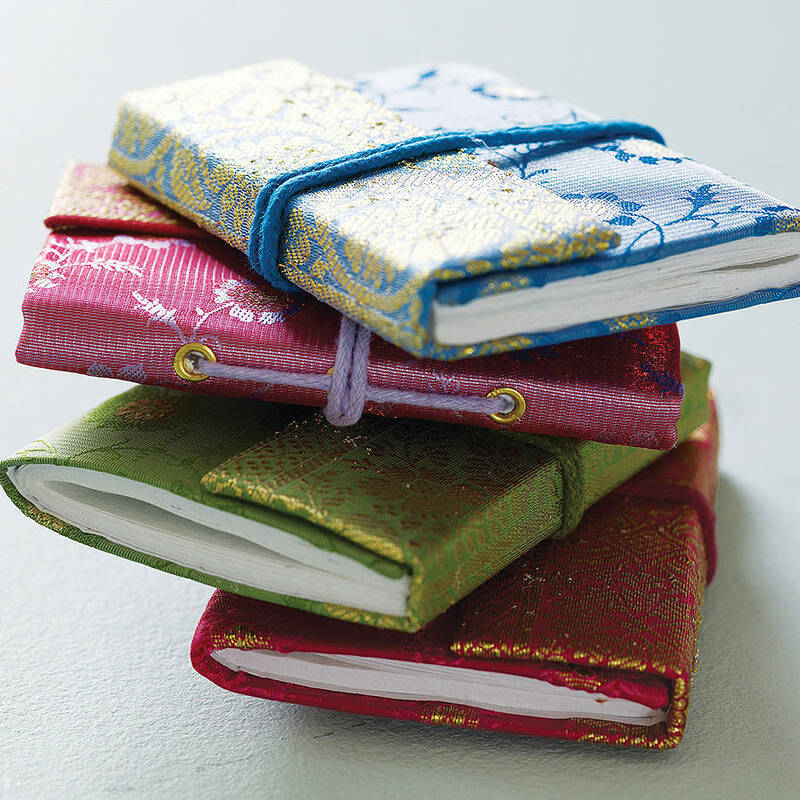 These notebooks are the perfect gift for those who love to write notes. 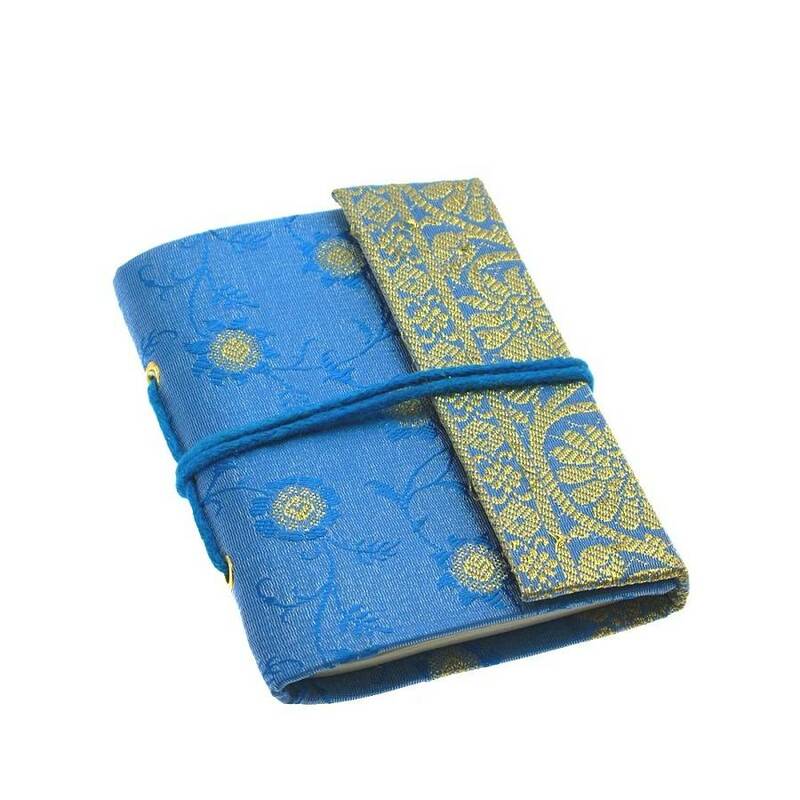 They are a handy pocket size and ideal as a teachers gift or Christmas stocking filler. 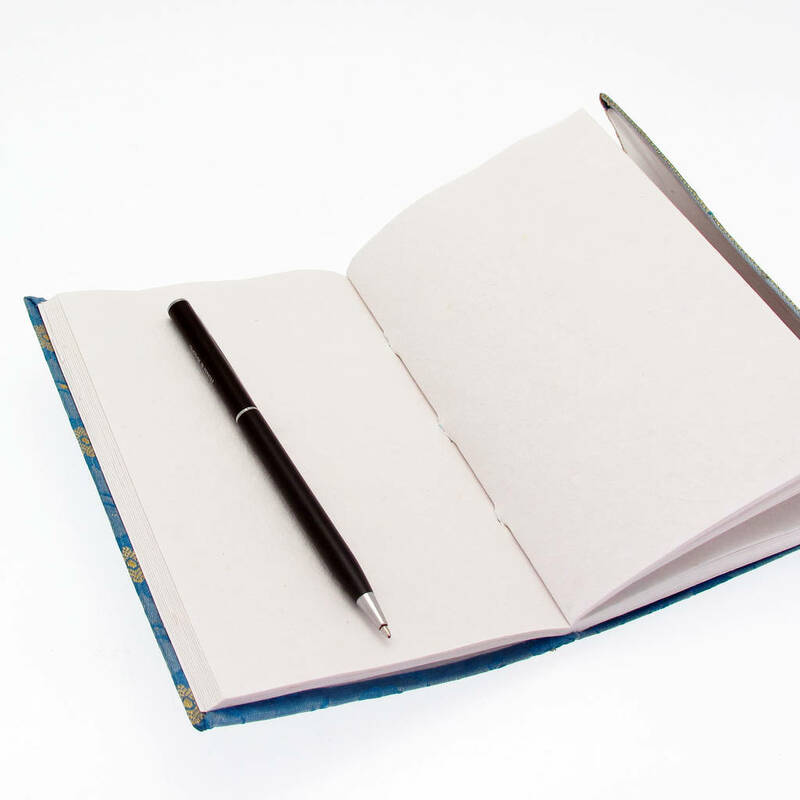 Each notebook contains 30 pages of blank handmade recycled cotton paper and is fastened with a traditional wrap around string. The cotton used is unbleached and is the left overs from the massive Indian garment industry. They are made in a small workshop in Rajasthan, India by skilled crafts people using a mixture of traditional and contemporary methods. 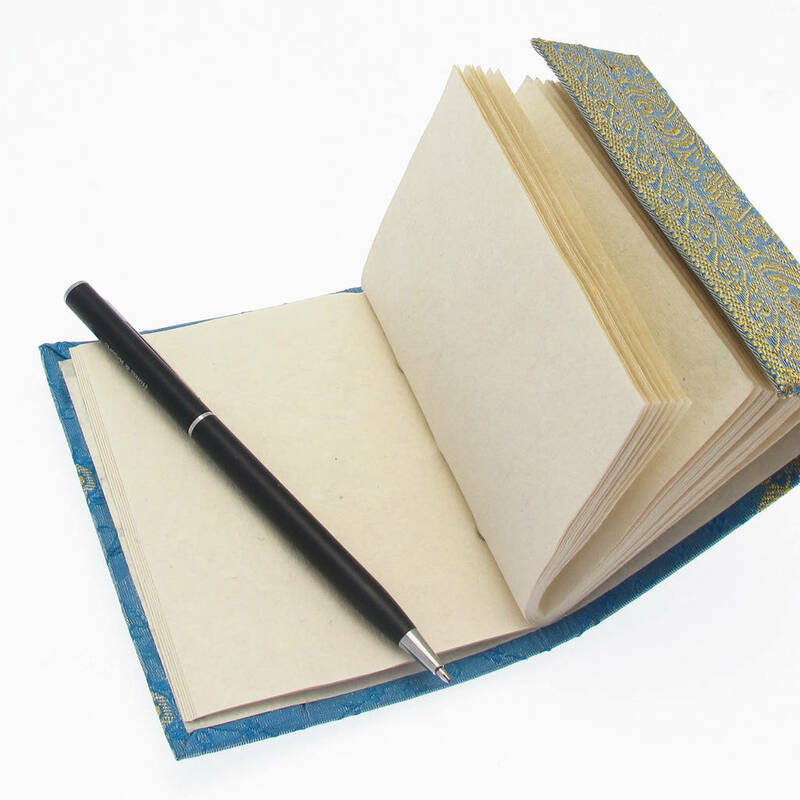 We don't recommend using fountain pen with this type of handmade paper. 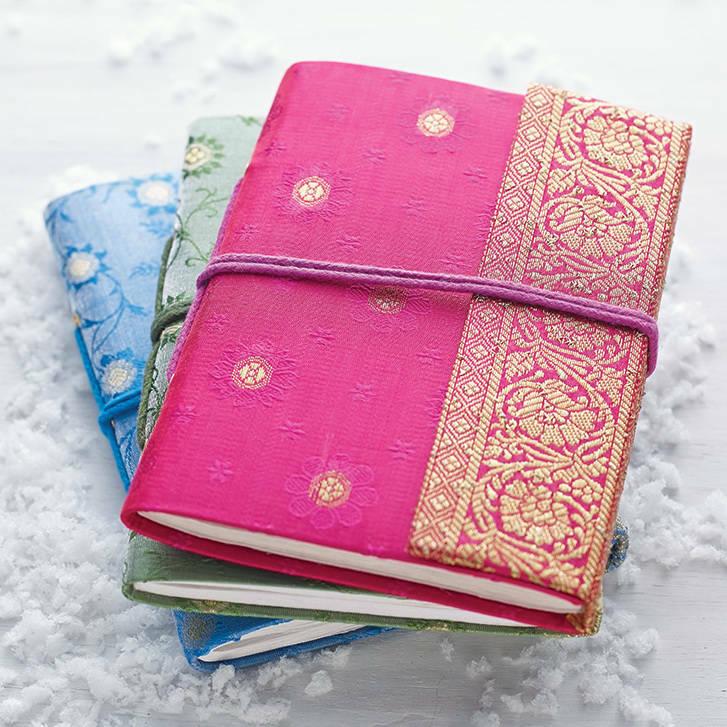 Notebooks are available in two handy sizes and six vibrant sari colours. Is it a gift? 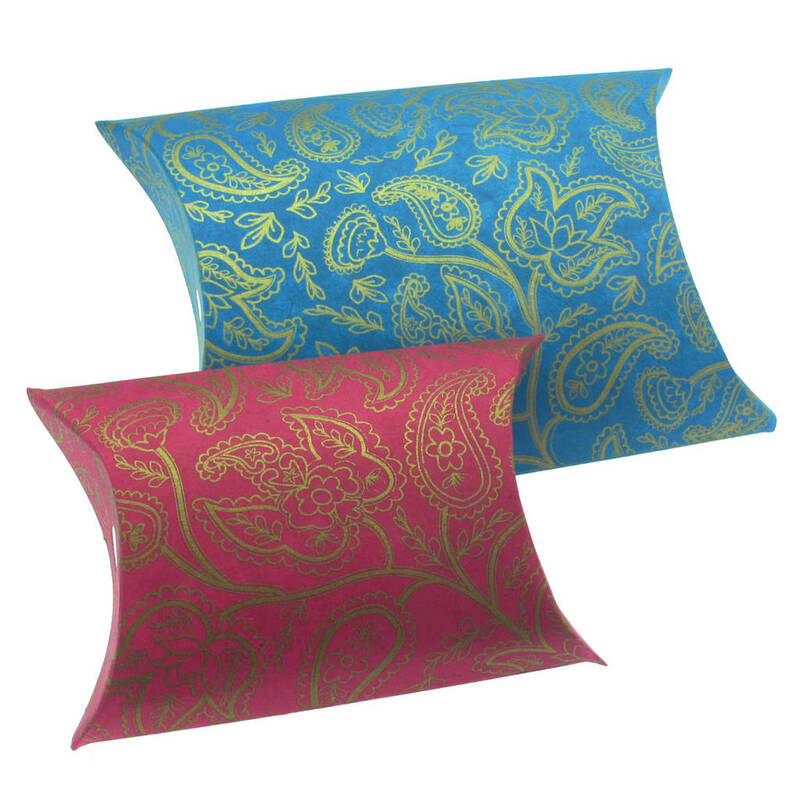 Then our beautifully elegant handmade pillow box is the perfect finishing touch. 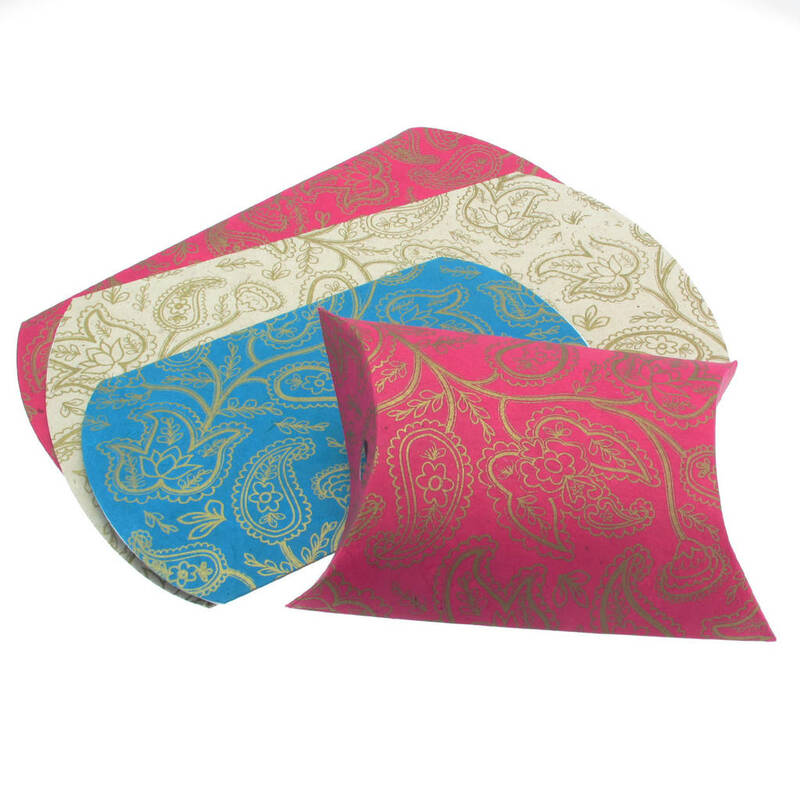 A delicate gold floral design covers either a cream, pink or blue easy to pack pillow box, making your gift even more special. 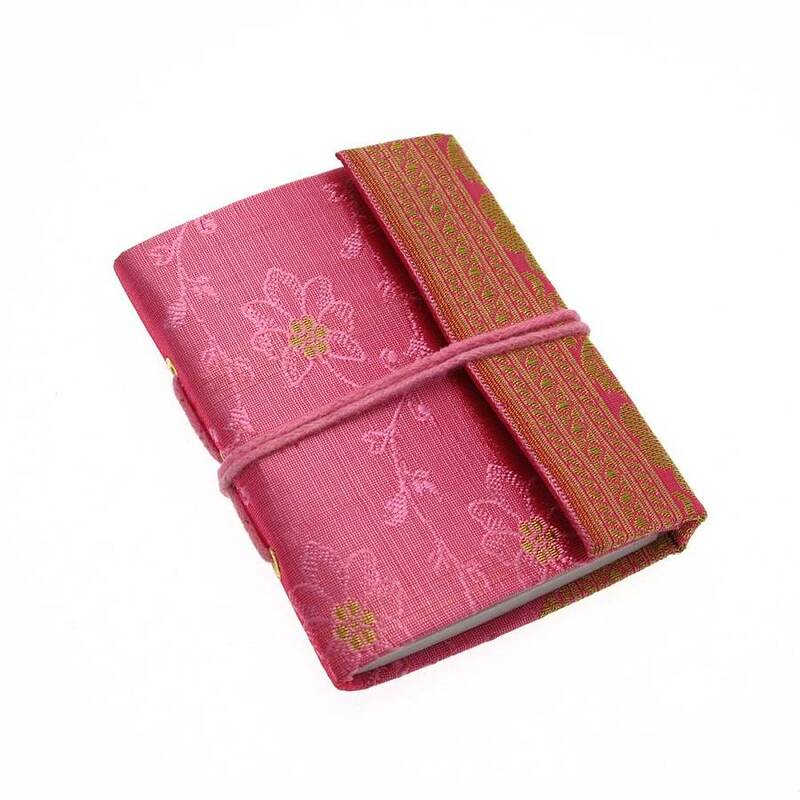 Available in two sizes, the small perfectly fits the mini notebook and the large is ideal for the medium notebook. Sari material cover with 30 recycled paper pages. We are a fair trade company and regularly visit our suppliers to ensure the highest standards are met. We quality control all of our products to ensure that you only receive the best. The sari’s come from Varanasi, one of the most religious cities in the world and a centre of excellence for sari making. We use new saris as we cannot guarantee the cleanliness of recycled sari’s and cannot always get the correct styles and designs. 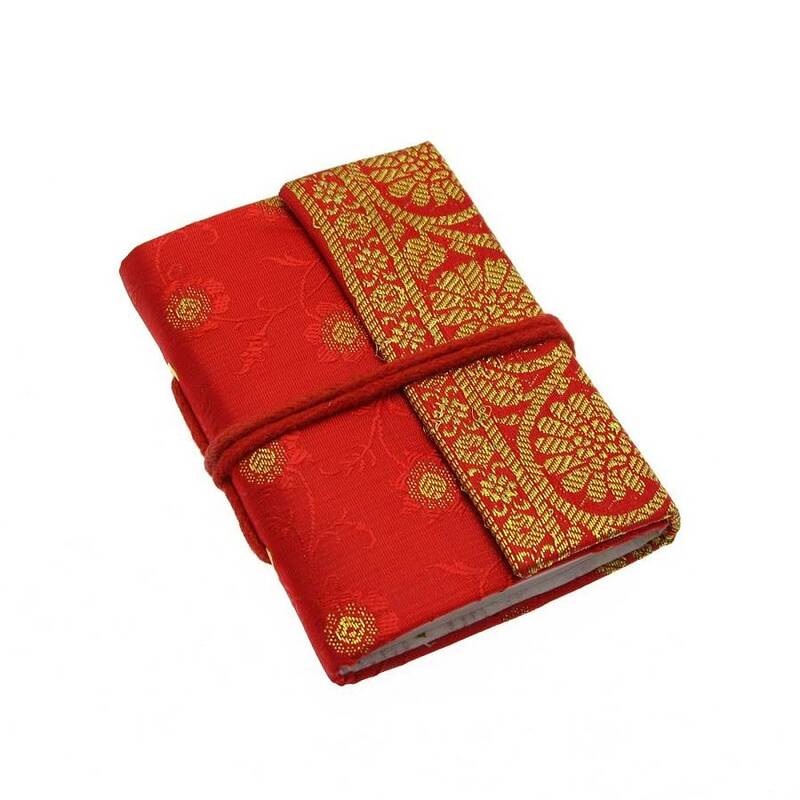 These notebooks have been expertly crafted using a mixture of contemporary and traditional methods and the pages have been hand bound and are ideal for travelling and perfect for doodling or diary writing.